Please note: VIP seats are available for this performance and include a post show meet & greet with the cast. These seats are in the front two rows and are marked as a red 'i' on the seating plan. 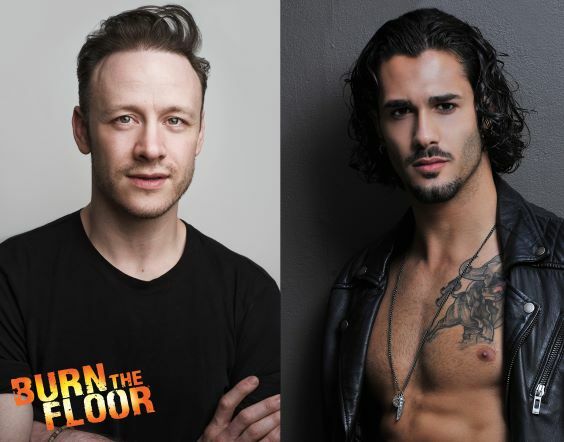 BBC Strictly Come Dancing champion, Kevin Clifton, headlines the world’s leading ballroom dance show Burn the Floor as it plays Lighthouse, Poole’s centre for the arts, on Thursday 9 May. Having been on Strictly for six years, Kevin has reached the ﬁnal an impressive ﬁve times and having performed in Burn the Floor on Broadway, the West End, and all over the world, views this latest tour very much as a homecoming. He’ll be joined in the show that has revolutionised ballroom over the last two decades by Strictly’s newest pros, Italian heart-throb Graziano Di Prima and South African star Johannes Radebe. Kevin and Graziano took some time out of their busy schedules to talk about all things Strictly, dance, and Burn the Floor. Firstly, Kevin congratulations to you and Stacey for becoming the Strictly Come Dancing champions, It must have been an amazing feeling? K: Thank you! It was an unbelievable night. it still sounds so strange being called a Strictly winner when I am so used to being called runner-up! We really didn’t think we were going to win, so we just set out to enjoy ourselves. It was such an emotional, amazing night for us and I’m so proud of Stacey, she is an absolute superstar! After six years on the show, with you reaching the ﬁnal four times previously, you must have hoped it would be ﬁfth time lucky? K: With Stacey having never danced before, I really thought we would be in the dance-oﬀ very early on, but we were never in the dance-oﬀ at all, which is incredible, and it’s all down to Stacey. She just wanted to get as much out of the Strictly experience as possible and she was 100% committed to it. I thought I would always be known as runner-up to be honest - I never thought I would ever actually win, so I’m incredibly happy! Let’s ﬁnd out a bit about you and Graziano - what is your favourite piece of music to dance to and what dance would you do? K: Paso Doble to the Moulin Rouge version of ‘Roxanne’. G: I love Salsa and Bachata music, but my favourite Latin dance is the Rumba because I feel I can express all of myself. K: I can’t ride a bike. G: People don’t know that I am alive for a miracle! I was born premature at six months, but I was strong and I survived! Life is a good gift, and dancing and love make me feel good! K: I love telling stories through our performances on Strictly. I love getting my celebrity partners to a point where they are comfortable, feeling conﬁdent and really enjoying dancing. The magic of the show also brings a massive audience to ballroom dancing. G: It’s a dream for a ballroom dancer being at Strictly Come Dancing, I feel so special to be part of it. K: I do enjoy teaching the celebs on Strictly, but performing is what I live for. G: Both of them because they are totally diﬀerent! I like teaching and making people love dancing, but at the same time I love to express myself dancing. K: I don’t really have a speciﬁc person in mind. I genuinely look forward to connecting with whoever I’m dancing with – as long as they are fully committed and nice to work with. G: My girlfriend Giada, with her all emotions are real! K: On live TV on my ﬁrst series of Strictly I did an Argentine Tango with Susanna Reid. I wanted to do the Michael Jackson lean from ‘Smooth Criminal’. I had the special boots and equipment. In rehearsal it looked incredible, but the live show was the only time I couldn’t get my boots clipped in, so I just leant forward on one leg. G: Not really, but I didn’t expect so much positive enthusiasm from the audience. K: My ﬁrst inspirations were my parents. In the ballroom world I grew up watching Jason Gilkison and Peta Roby who created BTF. I was also very inspired by performers I saw on TV such as Michael Jackson, Fred Astaire, and Robbie Williams who is my all-time idol. Later in life I almost gave up dancing, but was inspired again after watching Matthew Bourne’s Edward Scissorhands. G: Sounds weird, but my Mum. She bring me to dance and she introduced myself to the world. What is your process of creating a dance, from choosing the music, to the choreography, to the ﬁnished piece? How do you come up with a concept for a dance? K: It starts with the music. It has to be something that I feel I can create a story with and a feeling in the audience. Once I know what style of dance I’m basing it on, I try to think what the story arc is. Who are we as characters in this mini story? Once that is clear to me, I choreograph what I will do with the beginning, ending, and usually a change in dynamic in the middle section. It takes me forever, but once those elements are in place I can ﬁll in the rest with steps I feel will best show oﬀ what my partner has been working on. G: First is the music, then is the idea and character, and after all is the steps. Everything has to have a meaning! K I think you never really leave BTF. It becomes a way of life. It’s a relentless show that is really hard work, but also gives you a feeling, when you are completely in the zone of a ﬂat out BTF performance, that I’ve never found elsewhere. I’m addicted to it and I feel it has had more inﬂuence on my dancing than anything else I’ve ever been involved in. G: Because Burn the Floor is where everything begins! It is where I grow from a dancer to a performer! My second family. Why is Burn the Floor so inﬂuential and inspiring to the ballroom dance world? G: Because in Burn the Floor you are free to express the joy of dancing, in the competition you are judged based on a technical skill. In Burn the Floor you become an artist in all its aspects! K: BTF feels like home to me. It’s where I feel safest to express myself and explore new things in my dancing. It’s a family that I belong to and a very special place where the most interesting ballroom dancers in the world live. G: It is the biggest ballroom company, very inspirational to all Ballroom dancers and a reference to all new ballroom companies. For me, Burn the Floor means a lot, I can express myself in a very high-quality dance standard! K: I’m looking forward to being pushed to my limits again and connecting with a new cast of characters and learning from them. G: For me there are three things essentially that I’m looking for: ﬁrst enjoying sharing the stage with the other dancers, second have good feelings with my dance partners, and third give and receive a positive feedback from/to the audience. K: Dance is the original art form. Before speech or anything else we express ourselves through movement in our body language. It has the capacity to express things which words cannot. G: Dance for me is everything. Is not just a job, I enjoy every minute of it. K: I would love to go back to either the Fred Astaire era, as there was such romance about dance in those times. Or maybe the 40s when Lindy Hop was bursting onto the scene, as it’s such an energetic style. G: Jive for me is very inspirational. I especially like the era it comes from. K: Dance is the means to express myself, enjoy myself and entertain. A lot of people think dance should only be for yourself and it’s not about the audience, but I love entertaining the audience when I dance. G: Dancing is freedom of expression. G: Since when I was a child! I had nothing, I came from a humble family, but I never give up. I followed my dream to become a dancer and I make my passion work. K: I had many dreams of being a WWE wrestler, but that was never going to happen! I’d still love to explore acting more. G: As all boys I love football, but I would never change it with ballroom. K: Always remember why you dance. Don’t get caught up in the competitive nature of it and the obsession with being a perfect technical dancer. It always comes down to enjoyment, expression and entertainment. G: Yes. Everyone should dance, it makes you feel better, is good for body and mind and there is no age limit!